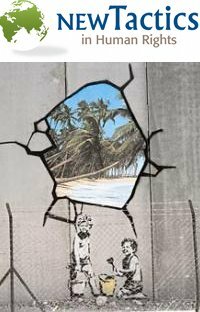 Bansky mural, via New Tactics in Human Rights. Slowly, I am learning to embrace the electronic world in an effort to harness ever more tools for revolution. Though I still don’t tweet, I have had the chance to be involved in several online webinars, have used Facebook as a tool for outreach and event organizing, have almost drowned in Google Docs to cowrite books in a cloud, and, now, this week, am co-hosting a virtual dialogue that spans seven days and as many continents in a keystroke. So, here’s your invitation to “Cultural Resistance: The Arts of Protest.” It’s part of a monthly online dialogue series for the website New Tactics in Human Rights, a project of the Center for Victims of Torture, this time in collaboration with Waging Nonviolence. It runs from today until September 18 and will be open to anyone in the 4,000-plus New Tactics online community, representing more than 120 countries. Anyone can join. I agreed to volunteer as host because not only is the specific topic close to my heart, but so is the goal of New Tactics as a whole: to build capacity for strategic thinking and tactical innovation. The website acts as a hub for learning and sharing within the human rights community worldwide. This is a much-needed solution to the isolation many human-rights activists face in their local communities; in stressful situations, many isolated activists find that they feel forced to reinvent the wheel or to use the same tired tactics repetitively. Right now there is lot of interest in harnessing creative cultural resistance — and many people using a wide diversity of methods, from graphic arts and puppets to language preservation, from songwriting and invisible theater to crafting and re-mixing traditional ceremonies. Enter this dialogue: Its aim is to introduce people to the different uses of cultural resistance — including discussion on when, how and why it works best, the benefits of this approach, and the risks and challenges one might face. Kristin Antin, New Tactics’ dialogue coordinator, tells me that there are usually 10 to 12 featured “resource practitioners” who agree to comment a couple of times per day during the dialogue. This one already has 18 who will be participating — and that doesn’t include participants who can join by simply registering on the site from anywhere in the world. The resource practitioners alone are based in Australia, Jordan, Serbia, the United Kingdom, Egypt, Mexico, the Palestinian territories, the United States, East Timor and Indonesia. They are experienced in community-based art projects, video explorations, guerrilla and object theater and more. The result of our discussions should be a great stew of on-the-ground stories and thinking from this awesome collection of creative activists, egged on by stimulating questions and commentary from the broader New Tactics community. Sharing our processes and tactics can be a big step toward more effective activism against the corporate power clawing away at our quality of life. Grassroots cultural work can be an incredibly powerful way to combat the corporate insistence on homogenization. It fights the pervasive and demoralizing message that individuals don’t count, and that cultural differences are liabilities. Validating cultural work and the connections it builds empowers individuals and communities, emotionally, physically and psychologically. Integration of arts and culture into our movements is a way to reclaim our agency, to affect change and to build power. Another reason this dialogue is important is that it helps confront the divide that often separates the fields of human rights and nonviolent civil resistance. In many circumstances, human rights workers consider themselves service providers, even when they’re doing documentation or accompaniment work. Often operating in societies not their own, they are reluctant to adopt the language of “resistance.” At the same time, civil resisters can be reluctant to embrace the professionalized, legalistic discourse of human rights. But these differences are barely skin deep. Human rights abuses often drive people into a mass movement, where they seek safety in numbers and work to ensure that those rights will be respected. Creative resistance is something that should bring human rights and nonviolent struggle together in common cause — in this case, through a common dialogue. In the spirit of innovation, then, come on and join the conversation, and share your insights about the methods and functions of creative cultural resistance in our virtual salon. I’m sure we’ll find that this dialogue — by using technology to connect people facing common challenges in far-flung places — will be an act of creative resistance in itself. Visit theantechamber.net. Consider contributing to a campaign to keep this reservoir of information alive. There are tons of documents on this site that explain how a gold bond from 1875 intended to REFUND the UNITED STATES rebuilding was illegally used by the Bush cabal to collateralize un-American activities including derivatives. Find out what’s out there, know where you stand in the mix, and see what you can change. There are many small, seemingly unimportant details that car owners in general forget to bring up with their insurance providers. Avoid speeding tickets and other moving violations like the plague if you are a young driver (or any age), or you will notice your premium sky rocket (especially true for male drivers). can compare multiple quotes almost simultaneously. All these above mentioned points are the main concerns with cheap car insurance quotes. form of compensation to them. Hi, There’s no doubt that your blog might be having browser compatibility problems. When I look at your web site in Safari, it looks fine however when opening in IE, it has some overlapping issues. I just wanted to give you a quick heads up! Besides that, fantastic site! It’s difficult to find well-informed people about this subject, however, you seem like you know what you’re talking about! Hi there! This blog post couldn’t be written much better! Looking through this article reminds me of my previous roommate! He constantly kept talking about this. I am going to forward this information to him. Fairly certain he will have a good read. Thank you for sharing! will strike and I won’t have sufficient coverage. Car insurance online will fetch you enough information you need to know before buying one. start with “https,” an indication that it’s a secured site. Some of the careers are of underwriters, insurance agents, insurance adjusters, insurance brokers, etc. a quote for tenant insurance on one of my properties. Fourth, the effect off accidednt forgiveness does not extend beyond your rates. prepared for the following potentialities:. your tenant to deal with the situation. for delivery and use recorded delivery or proof of postage.